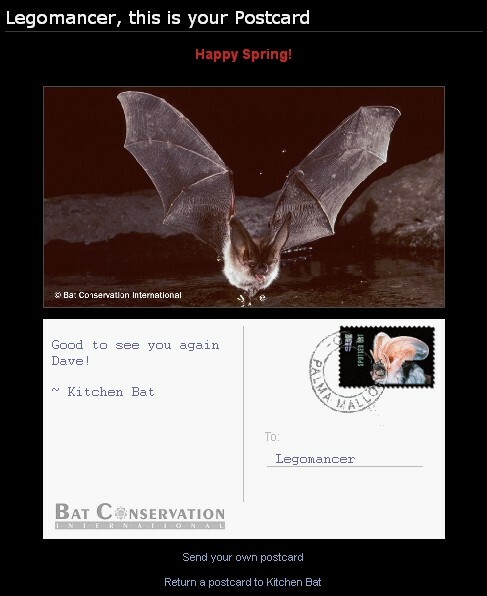 Every home needs a Kitchen Bat! He’s kinda wedged himself in the gap between the outer window and the screen. When he first showed up last year we were concerned because you can’t really see him breathing and he never seemed to move. But I poked him with something and he fidgeted a little, so that was that. He took off during the winter, but showed up again a few days ago. Haven’t seen any others around. I don’t know when a bat’s day starts. He’s never gotten up before I go to bed and he’s always there in the morning. Hopefully he’s spending those evenings eating mosquitos. I just got this in my email! Awww! ♥ ♥ ♥ bat! 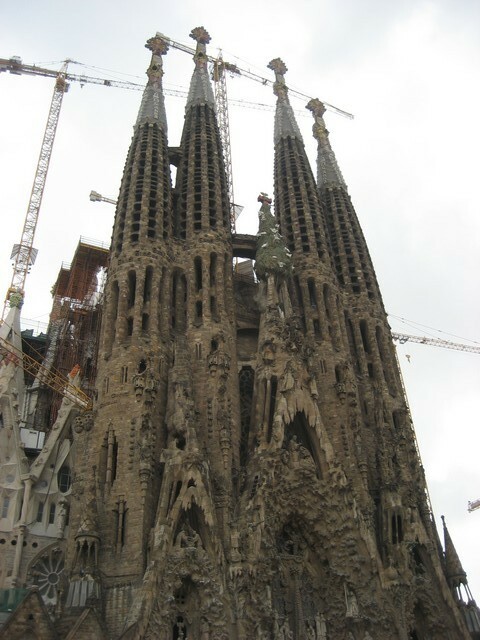 This entry was posted in Misc and tagged kitchen_bat, photos. Bookmark the permalink. He might find one of these more comfortable, or at least more private. It might even attract some of his friends, and it’s better than him roosting inside the house. He’s not inside the house. He’s between the screen and the partly-lowered storm window on the outside. The main window is between him and the interior. Even if we opened that window he’s still on the other side of the screen. But I agree, a roost for him and his friends would be cool. Have you checked your yard for possible entrances to vast, underground caverns? Might come in handy for when you decide that you ARE the night. If you plan on getting a roost, save some of the poops that he leaves where he currently roosts and put them / smear them inside the roost to lure him (and potentially others), else it might never find the roost. I was told that this works, and they do sell lure products that contain guano for this very purpose. If you get a roost paint it black as they like to stay warm. I had friends in Maine that built bat houses… better than a energy sapping and annoying bug-lamp that you’d see at all the beach houses. I grew up in an old farmhouse and they used to get in when I was a kid. I remember my dad killing one with a pillow. There would have been an exterminator at our house, pronto. They are creepy, disease ridden little rodents. Mrs. Mancor is definately made of sterner stuff than I am. They are creepy, disease ridden little rodents. Bats are beautiful animals. They help protects us from disease by eating thousands of mosquitoes every night. They are often confused as being rodents, but that are in their own order Chiroptera, and not Rodentia. 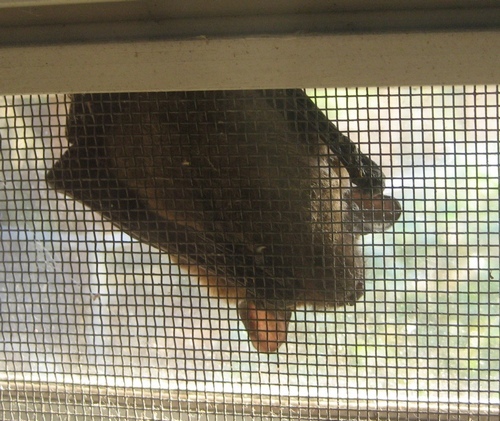 It is true that bats have been known to be vectors of disease… SARS, rabies, etc. but the benefits of bats outweigh this by far. 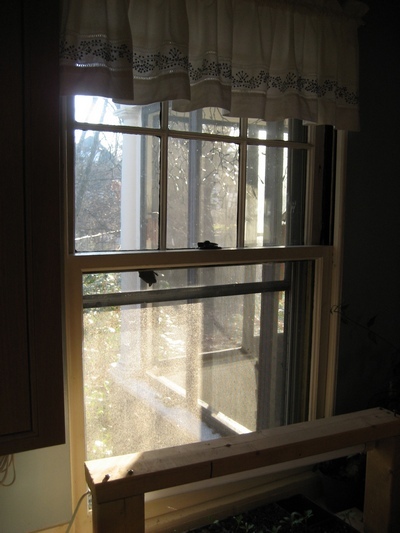 I’d rather provide a bat roost on a tree than have bats in my attic or in my kitchen window. That’s for sure, but I certainly would never kill one for no good reason. I love bats…I want to meet your friend. I never, ever dreamed I’d say this, but: That is one adorable creature of the night you have there. Na-na na-na na-na na-na BAT HOUSE! I think the Batman would dig this little guy. We have them here too. They like to dive bomb the dogs. I haven’t seen very many lately though. We also have two owls that hang around pretty close by and I think that is why. Awesome. We live in bat-flyover territory, though there are plenty of raccoons, skunks, and opossums. I’m more interested in that little garden in the foreground. Whatcha growing there? Huh? Huh? world would be a better place if more people remembered to do that. I’m so proud.